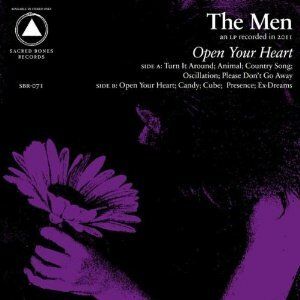 The Men, now on their fourth album, are probably one of the most exciting guitar bands around today. Following on from last year’s ‘Leave Home’, ‘Open Your Heart’ shows them genre shifting and demonstrates their boundless invention for crafting amazingly chaotic, beautiful music. Their DIY aesthetic is still very much intact but they are certainly moving on as a band. The Men have always had their roots in punk and opener ‘Turn It Around’ demonstrates this to perfection. Bashed out in just under four minutes, guitars are ablaze from the start and vocals are throwaway beneath the mayhem. It’s effortlessly done. With drumming bridge on exit, ‘Animal’ follows a similar vein, and is reminiscent of mid-seventies Iggy and The Stooges. ‘Country Song’ is a little less frantic and starts with a slow, simple guitar riff building through a multitude of distortion pedals to a huge crescendo. It’s clear that The Men will not be categorised and they hop from one genre to the next without breaking a sweat. ‘Oscillation’ is pure Sonic Youth circa EVOL/Sister and power riff noodlings are in plentiful supply. The Men don’t ever feel bound to create a track in the traditional sense and a lot of their output feels as though it’s been made up as they’ve gone along. Don’t be fooled however. The shifts in tempo show how calculated they can be – from lazy riff to speed metal and back again in a matter of seconds, demonstrating how well they know their craft. ‘Oscillation’ ends in a blaze of guitar mayhem which feels so dangerous and unpredictable, it’s an absolute delight. ‘Please Don’t Go Away’ takes on more experimental ground, sounding akin to early My Bloody Valentine, with a simple song drenched in fuzz and feedback. The vocal is barely audible and the crashing drums are clearly out to destroy any semblance of guitar noise that can be summoned, without quite making it. Again, production is loud and dirty, adding to the danger and authenticity The Men clearly want you to feel. Title track ‘Open Your Heart’ returns to more familiar punk ground with (now audible) vocals, huge riffs and a more traditional structure. It sounds like the Undertones being directed by the Ramones. It’s power-pop on an epic scale and is utterly sublime. ‘Cube’ is an out-and-out metal track with no apologies, no experimentation and probably more than a few guitars destroyed during its conception. It features minimal lyrics, with each guitarist trying to outdo each other. It’s ferocious and breezes in and out before you can catch a breath. ‘Presence’, like ‘Country Song’, is another slow builder and winds up into huge wall of sound, distorting melody and structure as it tries to sustain its shape. The whole track is mesmerising. At just over seven minutes, it feels epic and you never want it to end. The Men work staggeringly well at developing sounds as they go and if any complaint is to be wagered, it’s that it has to end. Final track ‘Ex-Dream’ is the album’s crowning glory. Guitars slide throughout, sounding somewhere between early nineties Sonic Youth and a slightly less fuzzy Mudhoney. It’s furious stuff, but not without a gentle hook to keep you guessing where they might go next. Being careful to showcase all four members, it’s very clear they’re a hugely capable band. This is the most coherent vocal throughout the record, and sounds almost as if they’re channelling Thurston Moore. The track crashes to an abrupt ending and I defy anyone not to give the whole record another run through. In terms of parallels, as mentioned previously, The Men sound like early Sonic Youth mixed with some of the higher points of seventies American punk and a tinge of My Bloody Valentine – without dropping any of their trademark DIY punk/metal sensibilities. The band play immaculately and every listen gives something new to love. I have no doubt you will be unlikely to find a more honest, experimental, balls out guitar record this year. The whole album is a breath of fresh air. This entry was posted in The Men and tagged Open Your Heart, The Men by admin. Bookmark the permalink.